Pretty cool take on the full base-class stalwart defender! This pdf of the Warrior Prestige Archetype-series clocks in at 9 pages, 1 page front cover, 1 page editorial/introduction (explaining the base concept of the series), 1 page SRD, leaving us with a 6 pages of content, so let’s take a look! So, here we go – the stalwart defender: Full BAB-progression, good Fort- and Will-saves, 2+Int skills, d12, full proficiencies, DR 1/- scaling up to 7/-, with +1 every 3 levels. Third level nets a dodge bonus that scales up every 3 levels….yeah, these guys are all about the defense, with 2nd and 5th level netting uncanny dodge and its improved variant. Thankfully, we get the class’s signature ability, defensive stance, at first level, with 4+Con-mod rounds per day, +2 per class level. This nets a +2 AC bonus, +4 Str and Con and +2 Will-saves…and before you see the abuse potential – yes, this has an anti-rage-stack caveat – kudos! “But this is better than Rage! !” – -Yup, the numbers are…and they’d better be, for this lacks the component of free mobility. Starting at 2nd level, the stalwart defender as presented here may choose from a broad array of defensive powers – from rerolling failed Will-saves to better defense versus feints and being bypassed via Acrobatics to halting foes, the power here are valid and diverse, with the more powerful ones sporting a sensible level-cap. And yes, there are some cool, new complementary powers to be found here that are not part of the base PrC – and they make sense – like retaliating when an ally is hit. Mobile Defense is gained at 8th level, whereas the PrC’s Last Word-capstone is moved to 17th level, to make way for the Mighty version of the defensive stance. This pdf also provides FCOs for the core-races and sample NPCs at 1st,5th,10th and 15th level, this time using a dragonblooded as a the base race. The pdf also provides an interesting elixir that enhances defensive qualities, but at the cost of the ability to move…Nice one! 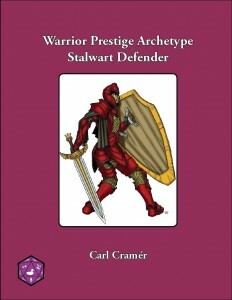 Carl Cramér’s Stalwart defender makes sense – at the first glance, the slight power-discrepancy compared to the barbarian may seem upsetting, but the class works out surprisingly well. It also makes the stalwart defender more beautiful from a design-aesthetic point of view – it’s just tighter, more streamlined and feels less like something tacked on, instead providing essentially a cool variant class. The new abilities and item just add icing to the cake. A great installment, vastly superior to the base PrC in aesthetics and execution, this is well worth 5 stars + seal of approval. You can get this nice class here on OBS and here on d20pfsrd.com’s shop!